Christmas is full of wonderful things, which means its full of adjectives! 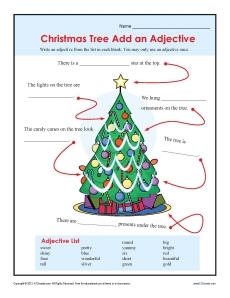 Your young student can practice using adjectives for a Christmas scene in this worksheet. Use it in conjunction with Common Core Standards for Conventions of Standard English for 2nd and 3rd grade. Other students may also find it useful and fun.